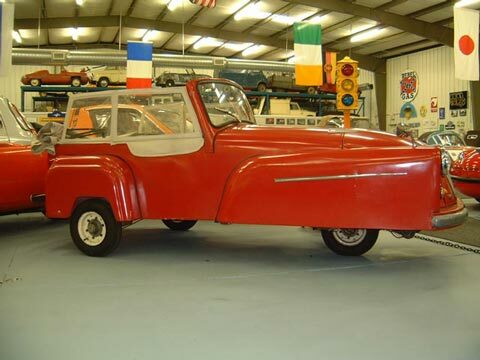 1957 Bond Minicar Mark "D"
The Bond Minicar Mark "D" appeared in May, 1956. It was similar to the Mark "C" but had the Villiers 9E engine (with the SIBA electrical system) with an optional reverse gear (of particular benefit to drivers holding a Group "A" license only). It also had an improved car-type electrical system (12 volts as opposed to the original 6-volt lighting) and new rear suspension. For the De Luxe model a SIBA electric starter was fitted, consisting of a single unit-embodying generator, starter and ignition built into the engine direct on to the crankcase. Reverse gear, in models fitted with it, is obtained by switching the engine to run in the opposite direction of rotation (accomplished basically by means of a second set of contact pints "timed" for opposite-direction firing but with other interior modifications over the standard flywheel magneto unit), the 9E engine running equally well either way. With such a system, all gearbox ratios are available for driving in reverse, but only first or low gear would be used. The model "D" was again produced in both 2-seater and 4-seater versions (of which this car is an example) with hoods and a Fiberglass hardtop variant for the 2-seater. The 2-seater Mark "D" ceased production in favor of the Mark "E" when this later Model appeared (December 1956). Weight: 485 lbs Electrics: 12 v 3 Wheels: 400 x 8"